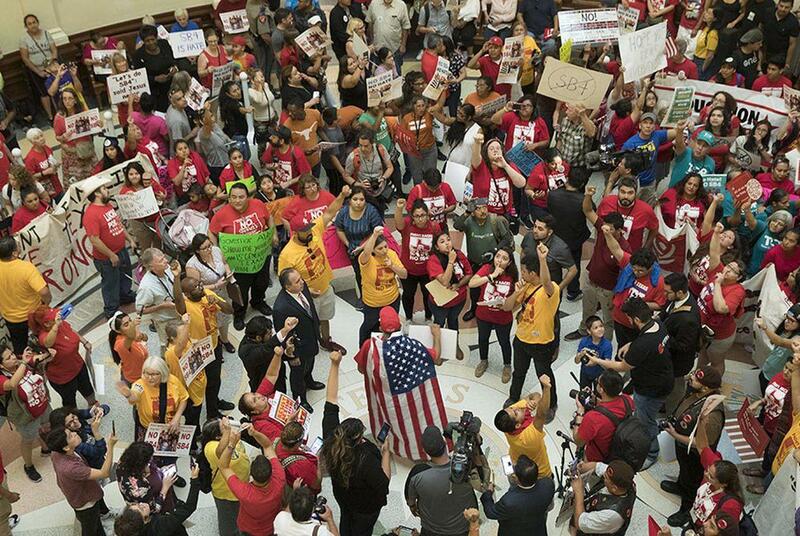 Demonstrators rally in the Capitol Rotunda against Senate Bill 4 on May 29. A panel of three appellate judges ruled Tuesday that most of the state’s immigration enforcement legislation, Senate Bill 4, can remain in effect while the case plays out, handing a victory to Gov. Greg Abbott and Republican supporters of the legislation. As passed, Senate Bill 4 allows local law enforcement officers to question the immigration status of people they detain or arrest and punishes local government department heads and elected officials who don’t cooperate with federal immigration "detainers" — requests by agents to turn over immigrants subject to possible deportation — in the form of jail time and penalties that exceed $25,000. 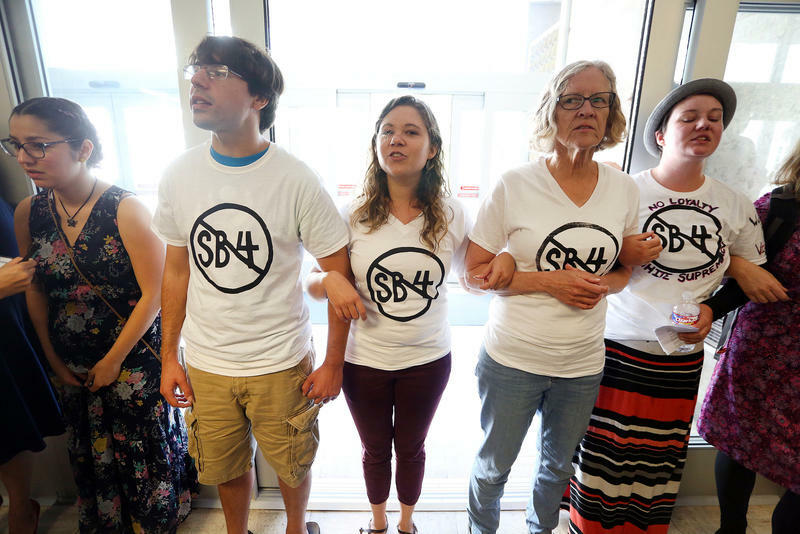 The one part of SB4 that is still on hold is a provision that punishes local officials from “adopting, enforcing or endorsing” policies that specifically prohibit or limit enforcement of immigration laws. The judges kept that injunction in place, but said it only applies to the word “endorse.” The bill, as passed and signed, would have made elected and appointed officials subject to a fine, jail time and possible removal from office for violating all or parts of the legislation. Abbott quickly took to Twitter to update his followers, highlighting that claims the bill would lead to racial profiling were rejected. "Texas Ban on Sanctuary City Policies upheld by Federal Court of Appeals," he tweeted. "Allegations of discrimination were rejected. Law is in effect." 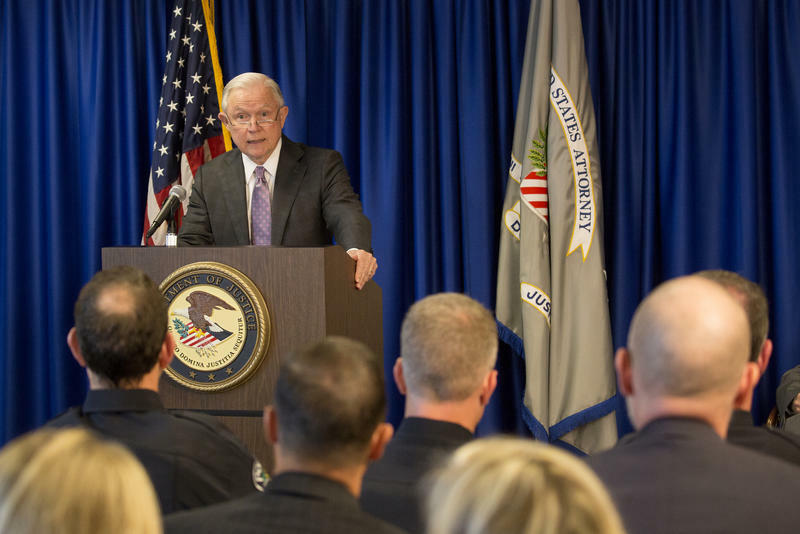 Texas Attorney General Ken Paxton also praised the ruling, saying in a statement that SB 4 is constitutional and protects the safety of law enforcement officers and all Texans. Attorneys arguing the case of Senate Bill 4 – Texas’ so-called sanctuary cities law –head back to federal court today. 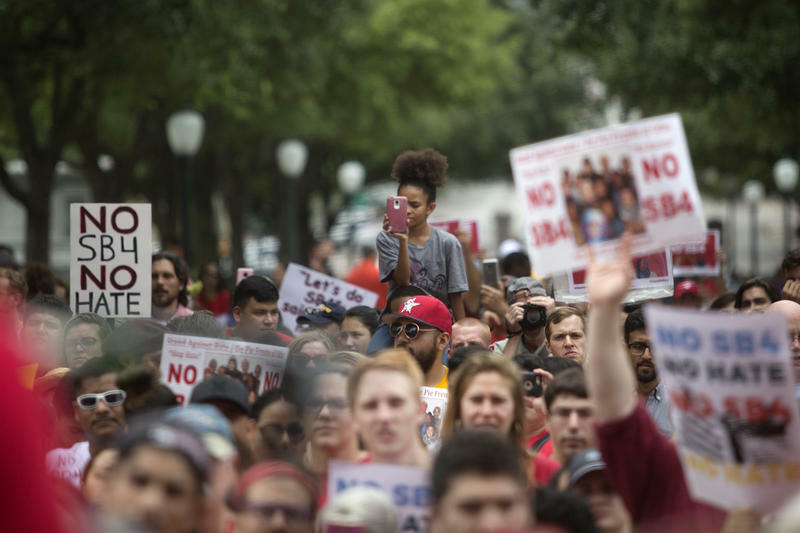 Judges of the U.S. Fifth Circuit Court of Appeals in New Orleans will consider a temporary block placed on most of the law in August, which was partially lifted in September.